No. Obesity is caused by excessive calorie intake and is not affected by the surgery. Weight can be controlled by proper feeding and exercise. Will it change her personality, disposition or intelligence? No. Dogs’ personalities do not fully develop until 1 to 2 years of age. If there is a personality change in a dog spayed at a young age, it would have occurred without the surgery. Are there any problems associated with spaying? A very small percentage of dogs have trouble holding their urine as they become older. This is normally controllable with medication. Shouldn’t my cat have a litter first? No. There is no advantage in allowing your cat to have a litter of kittens. In fact every heat cycle your pet has puts her at greater risk of uterine infections and uterine or ovarian tumors as well as increasing her risk of surgical complications. Your pet will be given a preoperative physical examination to help ensure her safety during anesthesia and surgery. Though it is routinely performed, ovariohysterectomy is major abdominal surgery requiring general anesthesia and sterile operating technique. 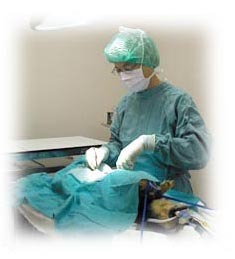 A small incision is made and the ovaries and uterus are removed. Depending on the case, removable or dissolving sutures will be used to close the incision. Recovery is generally uneventful. Your pet will stay in the hospital overnight so we can monitor her recovery and keep her calm and confined overnight.